A-Access Lock & Key has received hundreds of calls asking for help with chip keys and similar problems ever since we opened shop two decades ago! That’s why our Trusted Locksmith in Charlotte NC decided to make a post about it. Ask any car expert if extra car keys are a necessity, and they will answer “Yes!” Anyone who has broken or lost their car keys will agree that having an extra car key or two is very important. Keys wear out from daily use, and though we cannot help it, we sometimes lose or break our keys. It’s times like these when replacement keys become necessary. ‘Chip keys’ are also known as duplicate keys, transponder keys, and vehicle immobilizers. Transponder keys are each programmed into the computer of the car and will allow it to start. These keys are called ‘chip keys’ because of the microchip in the key. Some car models and makes require ‘reflashing’ so the car’s computer will allow a new key to be added in case keys are lost. There are other cars that need the immobilizer or the reflash to be reset just to add keys. Car manufacturers started implementing the use of transponder technology in their car keys in the early ‘90s to reduce auto theft, which was great. However, it added more cost to the car owner in terms of key replacement. Because each car maker uses a different set of transponder technology in their cars, a Toyota car’s chip key cannot be used on a Mercedes Benz car. These days, chip keys are very sensitive; in fact, there are chip keys that get damaged just by dropping them. So it is highly advisable that you don’t toss your keys around as the chip may crack when it hits the ground. 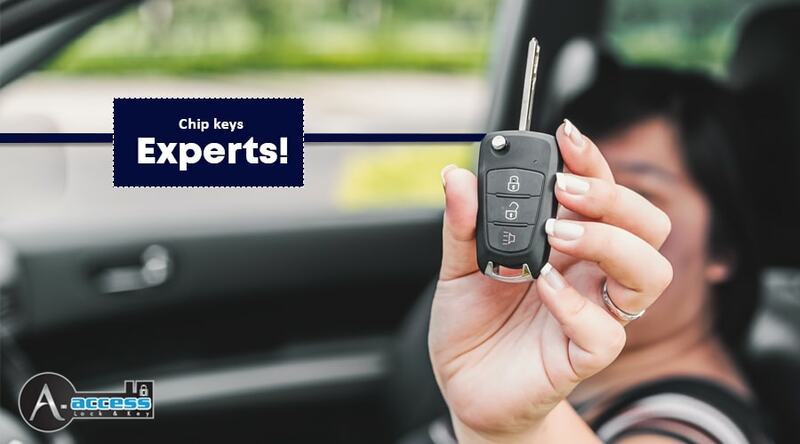 If and when that happens, you need an expert to replace your chip keys. Not just about anyone can clone or replace a chip key. It needs a higher level of specialization, so only trust experts with years, even decades of experience in replacing chip keys, such as ourselves! A-Access Lock & Key is a full-service Charlotte Locksmith that specializes in automotive key emergencies. If you lost your chip keys, we can come to you at your location with our van and program a new dealer-only key to your vehicle. Call 704-545-5410 for the best key specialist! And many other lock and key services. Call A-Access Lock & Key, the best Locksmith in Charlotte at 704-545-5410 for any of your car key emergencies. We offer the most efficient, quickest and competitively priced locksmith services in Charlotte and surrounding areas like Matthews and Indian Trail. Lost your chip keys? Don’t worry about it. We make new dealer-only keys! Get a free estimate from A-Access Lock & Key, Charlotte’s #1 Expert Locksmith. Choose A-Access Lock & Key. We are the key to your security! Call 704-545-5410 whenever you need help.